This week's featured blogger is Anna Lebedeva, who has been a globetrotter for a number of years before settling in Italy. A journalist and blogger, she promotes slow travel and eco-friendly holidays in Italy in a fresh way. Her blog, Green Holiday Italy, is a wealth of information for those really looking to go off the beaten path and provides plenty of foodie mentions to make you drool. She was also shortlisted in our 2013 Italy Magazine Blogger Awards. We got a chance to pick Anna’s brain on how best to travel green in Italy, enjoy her interview below. Anna, where are you from originally? I was born in Russia, however, I am a naturalized Irish citizen as I lived in Dublin for 16 years prior to moving to Italy three years ago. What made you fall in love with Italy? It is going to sound like a cliché but yes, it was food, wine and sunshine. Oh, and low property prices in rural areas! I am a passionate believer that consumers can make this planet better or worse, so I was always into local food, tried to support small producers, although it was not easy in Ireland. During my visits to Italy, I realized that it is very easy to live here with my philosophy as there are many small farms and producers in the area that provide endless supplies of delicious fresh goodies. That was a huge plus for me! What is it like for you to live and travel in Italy, tell us more about it! I live in a small mountain village in Abruzzo where I bought a house in 2007. Renovating it took a while and I still have a few small things to finish. Living in this corner of Italy is both wonderful and challenging. As my village is situated in the heart of the Maiella National Park, the scenery is spectacular; there are many great hiking trails just a short distance from the house. I have a small organic garden where I grow herbs, vegetables, apricots, figs and strawberries. Sounds idyllic, however, you need patience of a saint to live in rural Italy. Very few things can be sorted over the phone or email, I have to go everywhere in person, wait in a queue and learn not to expect good customer service. Travelling in Italy is magical. I love exploring around small villages and there are plenty of them here. Each has its own history, traditions, and delicious typical dishes. If I want to see a big city, I can just hop on a train, which I find pretty good in Italy (despite of what many Italians say). Italy is vast and you really need a lifetime to explore it, so I use any opportunity to travel around. Being a blogger helps me, as I often get invited on blog tours, to stay in places that I might never have heard of. In your blog you talk about slow travel, why is this important to you? I started travelling quite late by Western standards, in my mid-twenties. At first, I wanted to see as many places as possible in the shortest periods of time. Five-six cities in two different countries in a week seemed like a great idea. I was fascinated by people who said that they had been in 30 countries in five years. I wanted to be one of them! Then, at some point, I realized that although I was travelling a lot, somehow I did not feel like I was discovering new places… So, I decided to slow down and spend more time in each place that I visited, no matter how small it was. Now, when an Italian friend says to me, “You know Italy better than many Italians do,” I consider it the highest praise. Slow travel is more enriching and satisfying to me. What parts of Italy cater the most to green travel? Northern Italy has many hotels and guesthouses that would satisfy the most demanding green traveler. For instance, Tirler Dolomites Living Hotel in the South Tyrol, or Oasi di biodiversità Galbusera Bianca in Lombardy. 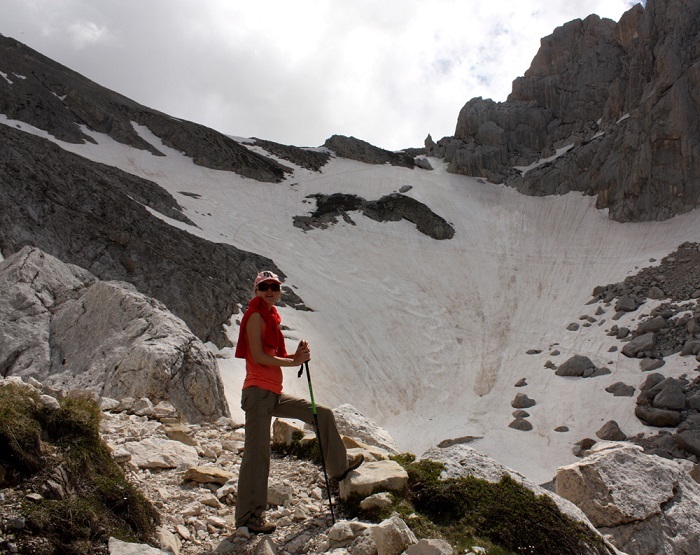 Abruzzo is fantastic for eco-tourism as here we have great wolf and bear watching tour companies and some truly green small nature camping sites. I am a trained journalist and I like writing. About three years ago, I set up my blog to scribble about my traveling green. For a while, my posting schedule was quite haphazard but with the help and encouragement from my boyfriend Dario (he is my chief online researcher), I started spending more time working on my blog and the traffic steadily grew. Who follows your blog, tell us about your readers? According to Google Analytics, about 45% of Green Holiday Italy readers are from such English-speaking parts of the world as the U.S., the U.K., Canada and Australia. 32% of them are from Italy, among which are many expats as well as Italians who are interested in slow and green travel. I also have regular visitors from Germany, Netherlands, India and Singapore. Some of my readers are bloggers, but most of them are people who love Italy beyond the obvious Rome, Venice and Florence. I started blogging about my green travels in Italy but, lately, I have expanded my topics to slow and responsible travel in the Bel Paese. On my blog, you will find posts about little known Italian dishes, local traditions, off-the-beaten-path destinations, eco-tours and hikes near big cities. After a while, I came to realize that words “responsible” and “slow” describe better the type of travel that I do and write about and they certainly include environmental awareness. Unfortunately, the word “green” has been overused and abused in recent years and doesn’t carry the significance that it used to have. So, at the moment, I am in the process of rebranding my blog to make sure that it reflects my travel philosophy and outlook correctly. I also blog a lot about Abruzzo, where I live, as every week I discover new beautiful corners of this unsung region. What tips would you give our readers on how best to be a conscious traveler? There is more to Italy than the Coliseum, Piazza San Marco and the Amalfi coast. Take time to plan your trip and look beyond the obvious. You will never see and taste the real Italy if you are not prepared to veer off the beaten track. Abruzzo, Basilicata, Apulia, Calabria are steeped in history, have beautiful architecture, excellent food and wine, sandy beaches and majestic mountains. Allow more time for each destination. An average tourist spends two days in Florence, rushing between Ponte Vecchio, the Uffizi Gallery and Il Duomo. I think it is an insult to this magnificent Renaissance city! You will be a happier and more enlightened traveler if you slow down. Skip a museum visit and instead sit in a café on a small piazza for an hour or two watching the local life go by. Shop at local markets or in small green grocers’ rather than chain supermarkets. Research what traditional dishes are in the place you are visiting and try them. You can learn a lot more from a local pasta dish than from a guidebook. Buy locally made souvenirs. One of the posts that brings a lot of traffic on Green Holiday Italy is The Pasta Artist from Abruzzo, about Novelia, who first contacted me via email to share her passion for the town of Sulmona and traditional cooking. We since became friends and she has shown me many hidden corners around her beloved town. Other posts that are close to my heart and reflect my travel philosophy are: 10 Things to Do to Make Your Visit to Florence Green and Unforgettable, Share Your Joy: Suspended Coffee in Naples, Explore Sicily on a Mafia-Free Holiday. Thank you for talking to ITALY Magazine, Anna! Happy blogging. Thank you! It is an honor for me to be featured here as I am a big fan of your magazine. I was delighted to be shortlisted in three categories of the Italy Magazine Blog Awards last year. Keep in touch with Anna of Green Holiday Italy via her blog, Facebook or Twitter.